Much has been written about Robert E. Simon since his passing earlier this week. One common strand -- perhaps one we too often take for granted -- keeps resurfacing. My parents moved to a flat roof townhouse off of North Shore Drive in 1970. Looking back, it was a lovely place to grow up. I didn't understand it then, but there absolutely was a sense of tolerance and equality. Everyone was treated the same, or so it seemed. I will forever cherish the oasis that was Reston, VA, a place where I grew up and shaped me into the woman I am today. A place where all colors and creeds came together blind to color. A place where I never experienced any intolerance or racism. Never saw a confederate flag and had my mind opened beyond belief to other cultures and people from all over the world. A place that I hope never loses any of these rare qualities. Where else in the WORLD can a single mother with 5 kids living in Section 8 housing provide them access to nationally ranked schools, brand new swimming pools, beautifully landscaped bike paths with ponds, parks, tennis and bball courts. We didn't have a yard but it seemed all of Reston was our playground. I could even go to the "other side of Reston" and see my friends for a dime on the RIBS bus. We were exposed to theatre, arts, youth sports and a wonderful community of parents who took care not only of their own but looked out for ALL of us. I am so very grateful for Mr. Simon's vision. In any other "low income" environment, our lives could have turned out so differently. Even after we moved from Cedar Ridge to Lake Anne, it wasn't easy for my Mom to raise and take care of all of us but no matter where we were in Reston and how tight things may have been financially, our childhood was fun, full and rich. I grew up in the Germantown section of Philadelphia. Germantown was a mix of row houses and mansions, thus patch-work integrated even in the 1950's. I even belonged to the first integrated Boy Scout troop in Philly. Members of my patrol ranged from national merit scholars to (ahem) future clients of the state criminal justice system. The diversity worked. Brains when we needed brains, and muscle when called for. Although a relatively small troop, we won every contest. So when when my wife called me at work to say she found a house, and described the Reston concept to me I said, "Buy it now!" "Don't you want to see...." "No, just buy it!" Never regretted the decision. In 1978, my single mom moved her remaining 3 children from New York to a place called Reston. It was the best decision she ever made. We were pioneers in an amazing experiment that allowed all types of people to live and laugh and experience the best of everything life had to offer. It didn't matter if you were from a lower income family or one the fortunate people who had those beautiful homes on the lake, we were all treated with the same respect; we became friends; we got to experience the wonders of nature, culture and architecture and we were able to get a great education in a safe and nurturing environment. Everyone seemed to be responsible to everyone else's well being and we were so proud and cared deeply about the place we called home. I grew up going to school with kids from a myriad of cultural, racial, economic and religious backgrounds. We were taught to acknowledge and appreciate all of our differences, but more importantly we were taught to see each other as humans and to treat one another with the same kindness and compassion regardless of our differences. Interracial couples were commonplace in my high school in the mid-80's. Religious holidays were shared with friends regardless of our own religious affiliations (or lack thereof) through a spirit of respectfully sharing our personal beliefs without the intention of conversion. And growing up with a wealth of nature around us we came to understand and appreciate just how precious our environment is and that it deserves not only our respect, but our protection. Being a community filled with people from all parts of the government from diplomats to congresspeople, federal clerks to federal lawyers, we came to know and understand the importance of political activism. Our community had soccer fields and theaters, nature paths and lakes, we grew up knowing there is more to a person than their profession, and that life is made all the more rich and fulfilling through a diversity of expression. So much of who I am and how I was formed was because I had the privilege of growing up in "A Place Called Reston". And I know so many of my peers share this deep appreciation for what a unique and truly magical place Reston was to live in. None of that would have happened had it not been for the vision of Robert E. Simon. I can only hope that one day all communities in America can share the same ideals that were, and still are, so integral to my hometown. 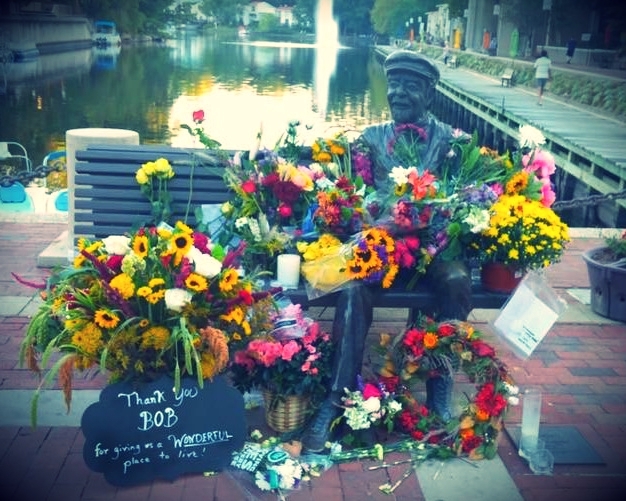 Thank you, Bob. Rest in Peace. A candlelight vigil in Simon's honor is scheduled for Friday at 6:45pm at Lake Anne Plaza.